The origin of money extends back in time far beyond the recorded history of civilization. Indeed, the definition of money is much broader in scope than many would typically expect. The oldest surviving written records are in cuneiform on clay tablets from Ancient Mesopotamia. These records show that the monetary system as early as the 1700 BC period was based upon weighed amounts of silver in that region of the world suggesting that a metallic monetary system is perhaps at least 4,500 years old. Indeed, Hammurabi’s Law (1792-1750 BC) sought to regulate prices prescribing the value of fines by the courts in terms of the number of “shekels” – a standard unit of weight. We do know that even prior to this period in time the world was effectively utilizing a barter system that most likely prevailed perhaps for thousands of years. Within that system, the units of value had clearly changed over time and indeed varied from one region to another. Everything from whale teeth, stones, sea shells, grain, cattle, sheep, bronze tools, feathers, beads and globs of metals from gold and silver to iron have all served as money in different parts of the world. Ultimately, the definition of money itself is purely a medium through which an exchange between two parties takes place. Therefore, the person manufacturing tools or leather goods would accept in payment food. For the most part, economic life in ancient times was very much self-sufficient. One would try his best to grow the necessary crops or breed the necessary cattle in order to survive. Still, one might accept some goods in trade even if you might not have a personal use as long as you know that there is a demand from some third party. Barter at times is effectively similar to a wholesale transaction between a distributor and a retail merchant who trade cash for goods with the transaction being completed when the retailer finally sells the product to the end consumer converting his product back into cash. ceremonial, religious rites or commerce, etc.) has been the very mother of necessity for the birth of money as a medium of exchange. In essence, money is the physical language within a transaction in much the same manner as speech facilitates the emotional and intellectual communications within society. There is little doubt that barter system itself provided an impetus for the development of money from purely an economic perspective of efficiency. However, there was another stimulus that aided in the development of money and that was taxation in addition to fines, penalties and lawsuits. In fact, the very word to “pay” is derived from the Latin “pacare” meaning originally to pacify, appease, or make peace with. In the published economic translations of the legal texts from Babylon published by the British Museum, we find legal cases being tried as far back as 5,000 years ago. Clearly, lawyers may have predated bankers. In essence, tangible objects began to emerge in various cultures as a medium of exchange within transactions. As within any consumer system, one particular item tends to emerge as the most popular among many. In this way, money evolved out of a variety of customs perhaps as a hybrid of the barter system thus replacing a wide variety of mediums with the most preferred. Given the fact that much of the Third World has been at times thousands of year behind in cultural development compared to Western and most Asian societies, that it is possible to examine primitive forms of money in comparatively modern history. By examining such systems, we can grasp a better idea of how money itself has evolved over thousands of years. In Asia and in Africa, cowrie shells became a prized possession thus lending itself to emerge as a medium of exchange due to its valued status within those societies. In the case of China, the first forms of bronze coinage were cast in the shape of a cowrie shell thus retaining the familiar shape while combining it with a valued commodity – bronze. Among other forms of money in primitive societies, we find everything from wampum (beads woven into a belt used for ornamentation) in North America, Yap disc-shaped stones with a whole in the center some measuring as much as 12ft (4m) across (used as late as the 1960s), and whale teeth (in Fijian society) and cattle, which were even used during the primitive periods in western culture as well. We also find manillas (copper half rings) in west Africa which were ornamental metallic objects worn as jewelry that served as money as late as 1949. From ancient Britain, early civilizations of the Celts used bronze rings as ornamentation as well as money. In Santa Cruz, primitive money took the form of red feathers glued together on to a vegetable-fiber coil some as long as 30ft. The value depended upon the brightness of the color. In regions where gold was present, it is entirely probable that gold emerged, such as in Turkey and Persia, as a prized metallic medium from which objects could be fashioned into jewelry. We do know that gold jewelry predates any gold coinage by thousands of years based upon excavations of tombs from Egypt to Greece. Many great kings were buried with gold objects and some entirely clad in gold. This shares a common bond with many other forms of primitive money that emerged as a valued object for purposes of ornamentation in regions such as Africa. It is also clear that money has emerged in primitive societies even where precious metals were scarce or not present. 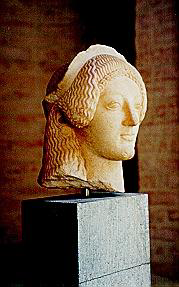 The development of money in Italy took the form of bronze traded initially in lumps but later in standardized weights. Bronze was a useful material that could be fashioned into tools from plows to swords. Like in Italy, bronze emerged in China as the medium of exchange as well. Emerging out of necessity, bronze became a useful element from which tools and weapons could be fashioned. As its value grew in acceptance, bronze was cast in the form of the old familiar cowrie shells. As time passed, bronze began to trade in the form of a hoe and knife but in miniature form. Clearly, as bronze began to emerge as a medium of exchange in China, the shape of the money retained the more primitive tools out of familiarity. There is also considerable linguistic evidence that demonstrates just how money became a medium of exchange while the unit of true value remained in form of agricultural products and cattle. The English word “ounce” is derived from the early Roman coin “uncia” of which 12 equaled one pound. In Latin, the word “pecuniary” means money. The root of this word is “pecus” meaning cattle. 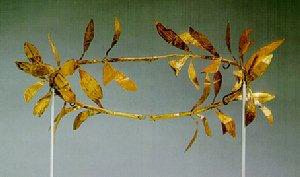 During the mid-5th century, Roman bronze bars known as “Aes Signatum” were used as a medium of exchange. One design is that of a bull, a direct link illustrating cattle as wealth. 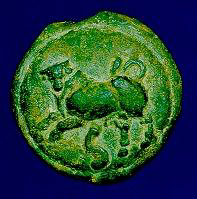 Cattle continued to be used in designs or markings for coins during the later “Aes Grave” period of 280-240 BC (illustrated above). Thus we find that the words “capital” and “cattle” have come down with a shared common bond when cattle was the measure of one’s capital.